The kids spent most of the week playing "birthday pizza party." It's just as it sounds: they would pretend it was one child's birthday (they took turns being the birthday kid). All of the other kids would bring him/her "presents" (toys wrapped in doll blankets), sing happy birthday several times, and cut the cake and pizza. 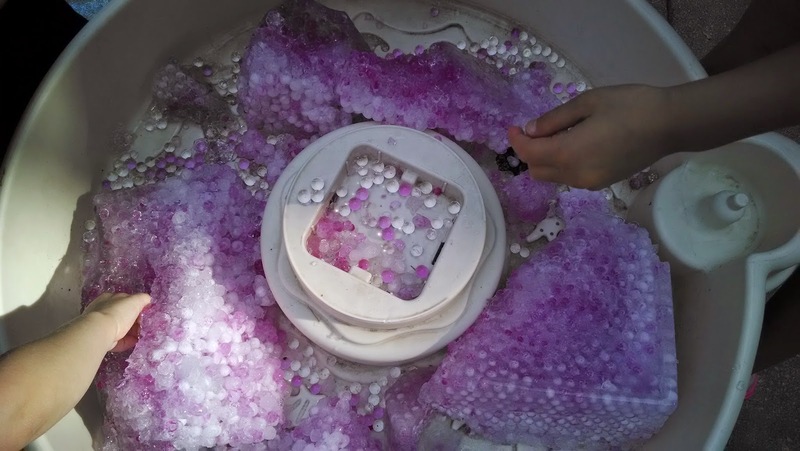 We had a bin of water beads that needed to be thrown out. I decided to get one more use out of them and did a frozen water beads sensory activity. I got the idea from Pinterest and the kids loved it! 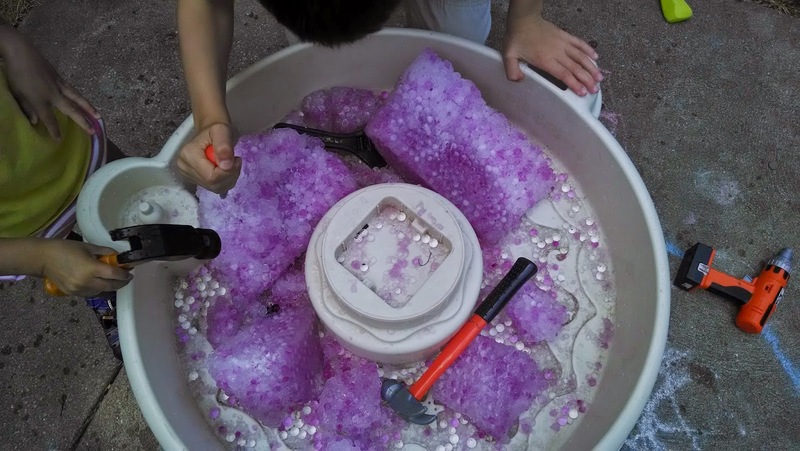 The beads remained in frozen blocks for a long time, so the kids got the play tools involved and broke off pieces. 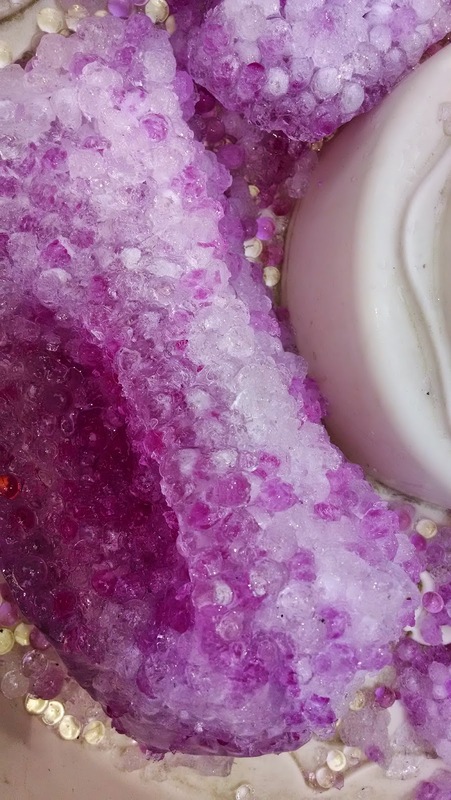 Just beware if you want to try this activity for yourself: 1) I put the beads in a smaller container in our deep freeze overnight. Luckily I was up late doing laundry because I discovered I had to move the water beads around in the container or only the top layer will freeze. 2) This activity will destroy the water beads, there will be no more playtime with these after this. Sprinkler time! We've had a bizarrely cool summer, so we've tried to take advantage of any somewhat warm days. 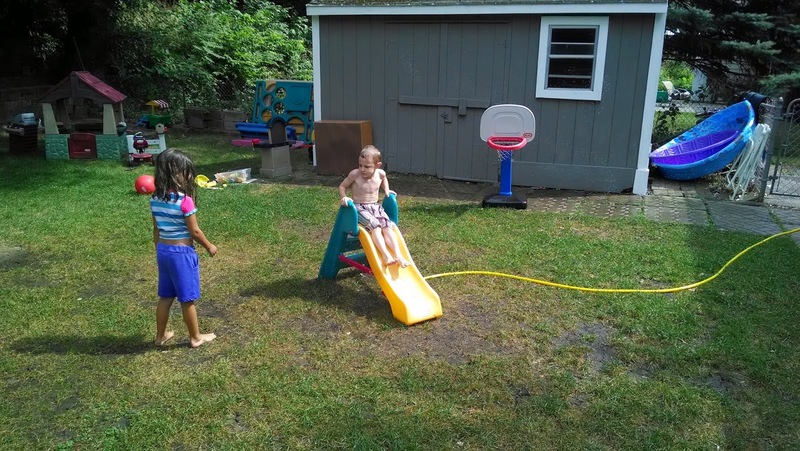 Harrison got creative and put the slide over the sprinkler for some extra wet sliding fun. This made the ground super slick and the kids wound up mud covered and had to be hosed off when they were done. Elizabeth loves to color and just this week discovered she could also color ON things. The kids painted wooden trees (found at Michael's for .29 cents a piece) and then painted pictures of their own. Elizabeth still enjoys painting her hands....notice I say paint her hands, not painting with her hands. The kids finally tried out their Instagrow Snow the minis got from the Omaha Children's Museum (read more about our weekend getaway here: http://ashlen-kidspert.blogspot.com/2014/05/weekend-getaway-omaha-ne.html). It didn't make quite as much as I expected, but the kids enjoyed watching the snow grow and learning just how it worked. The kids had me trace their bodies on the patio with sidewalk chalk and then decorated themselves. All of the kids loved this, although a few of the younger kids (age 2) had a hard time staying still while I quickly traced them. We had our music hour complete with kid tunes, instruments (they claimed to be starting their own band), singing (they made up their own songs for one of the first times), and lots of dancing (which is mostly just stomping as hard as they can). Not surprising that they were all beat after that hour long work out! Play Doh time with cookie cutters. A few of the older kids made Play Doh figurines that they were quite proud of. A few rainy/muddy days meant all inside time. 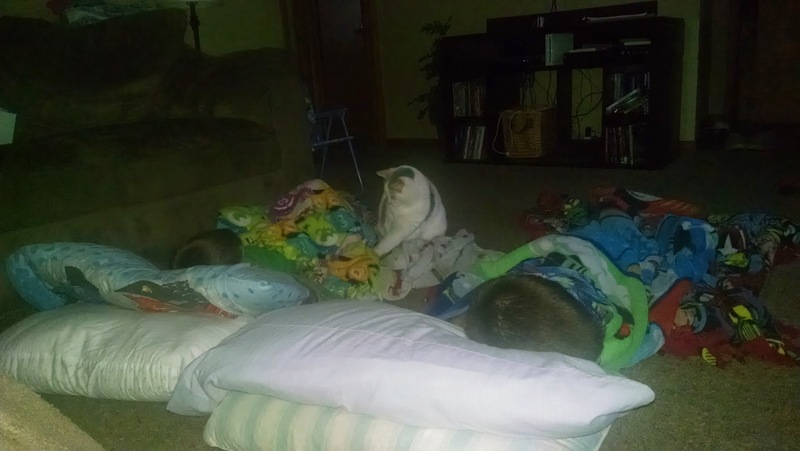 The kids asked to watch a movie ("Cars"), but that didn't last long before they were off playing. The big kids told all of the kids all about the United States using the Tag reader map. I thoroughly enjoyed listening to two six year olds b.s. their way through the map......while the younger kids were completely in awe of them. Just another day with a slight mess. 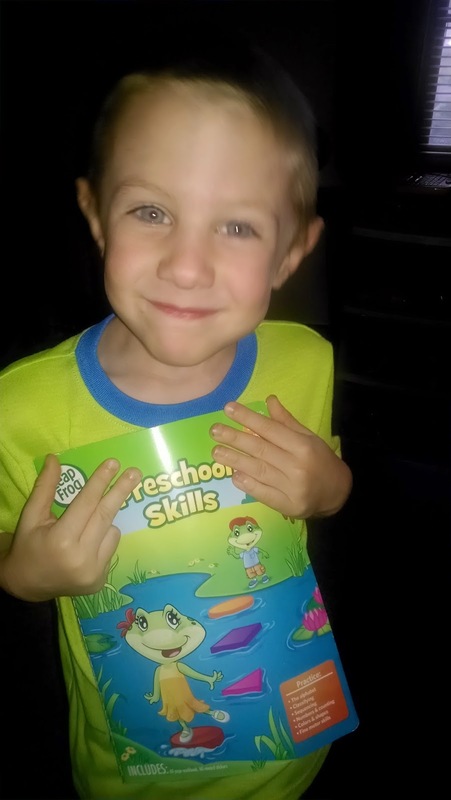 Harrison was the first one to finish (one of his) summer workbook! 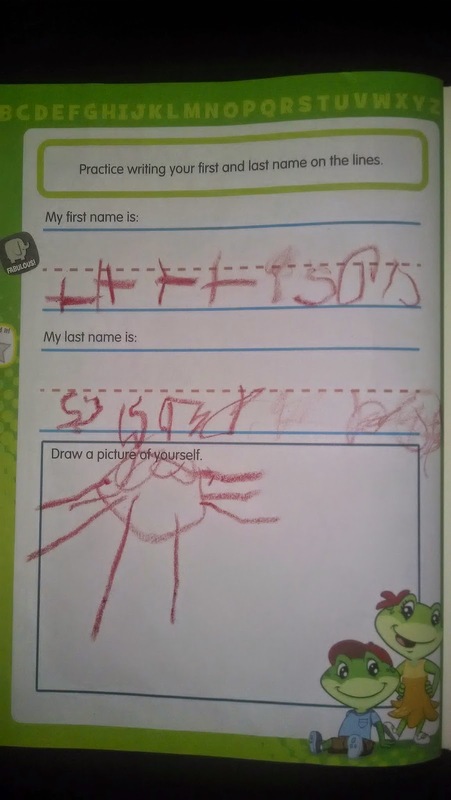 He's quite proud because he learned to write his first name and most of his numbers. 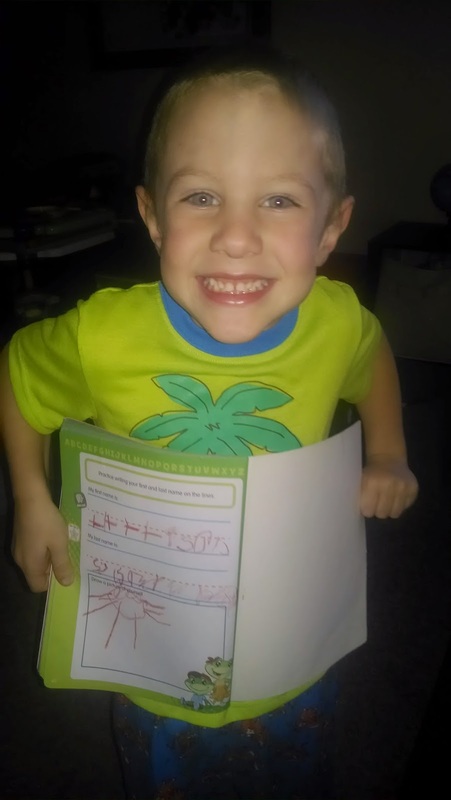 His next goal is to learn how to write our last name! We made "Frozen" slime (the blue) and "Teenage Mutant Ninja Turtle" mutagen (the green). 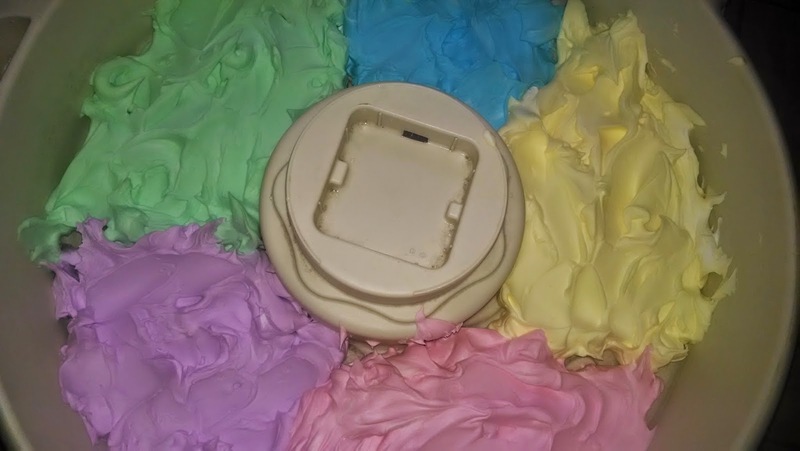 The kids LOVE playing with slime, but it's quite the mess for me mixing it together! The kids had glitter everywhere after playing with this because they wrapped their arms and legs in the slime and pretended they had broken bones. I love listening to the scenarios they come up with! 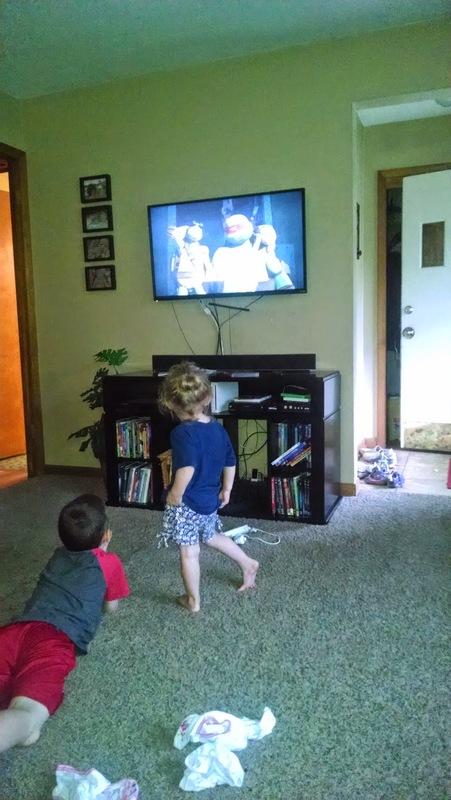 Elizabeth has developed a love for "Teenage Mutant Ninja Turtles." She had to wear her flower shorts with her "turtle shirt." On Thursday night the boys WOULD NOT go to bed. 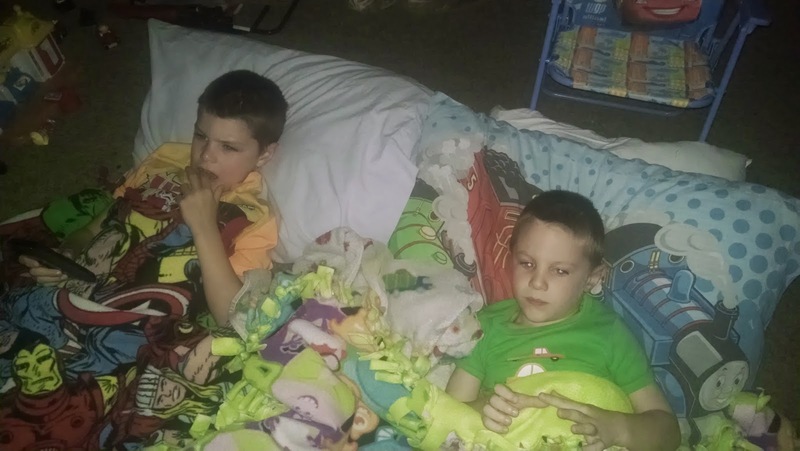 After attempting to wear them out, fighting with to go to bed, at midnight we finally settled on a living room slumber party (I took the couch) while falling asleep to Netflix. The boys and I were quite tired the next day! I awoke at 6:00 a.m. to find Sophia playing with Harrison's blanket trying to wake him up to pet her! 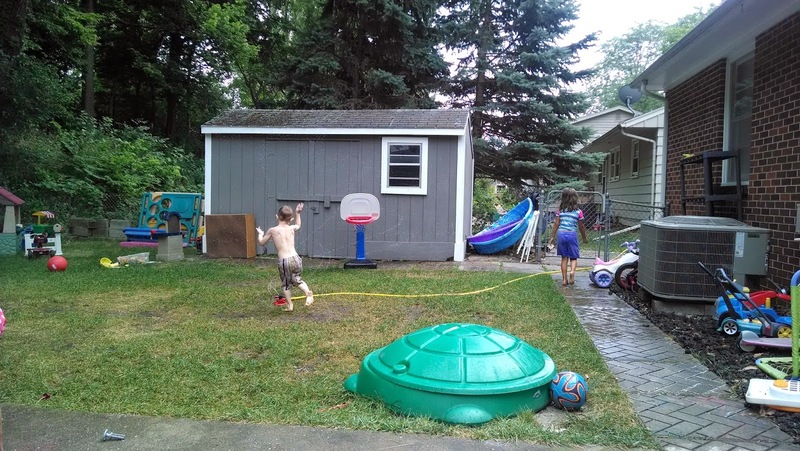 We got quite a bit of rain and the result was a very muddy backyard, which meant no playing outside. I had planned for the kids to go outside, but instead we brought the fun inside. I carried the water table full of rain water into the kitchen. The kids measured the water in the table and then had some fun with mixing colors! First they used red and yellow to make orange. Hoping the water would be light enough for the other colors to work, I had them mix blue and yellow and then blue and red. The kids loved seeing the colors mix together and loved playing in the water with spoons. Max made a snack for the kids all by himself! He wanted a dirt cup and told me "mom, I'm going to do it a new way. My way." I wrote out 3 items for me to get (gummy worms, chocolate pudding, and Oreo pudding), pre-made the pudding (I helped a bit with that one), and got everything all together. The kids loved it. Model Magic means it's time for handprints again! I was really disappointed with this batch of Model Magic because it was extra sticky. 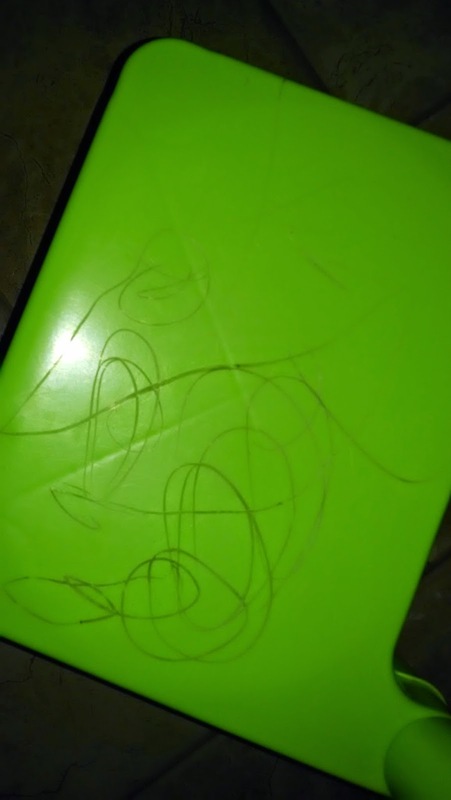 So much so that it stuck to the kid's hands. I had to have several of the kids use flour on their hands so it wouldn't stick. Elizabeth is such a good Lil Momma. 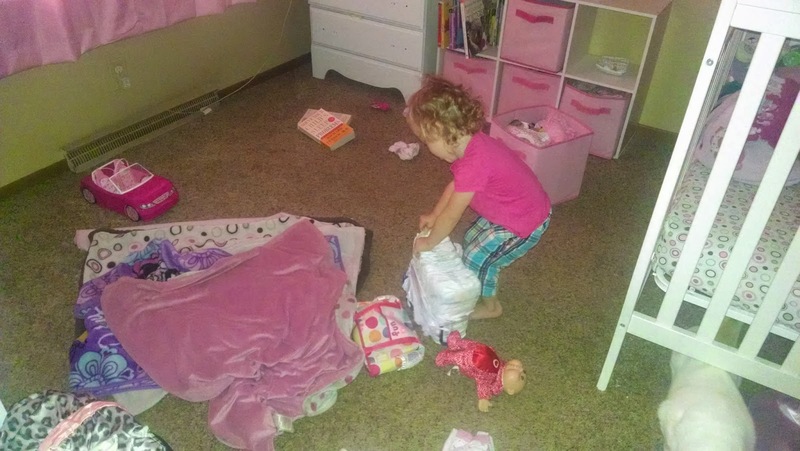 She put her baby down for a nap, changed her baby, sang to her baby, wrapped the baby up, showed the baby how to put on underwear and potty in the potty chair, and my favorite: reading the doll baby books (or as she calls them "book about Bup"). This is my favorite because the books she is reading is "What To Expect The Toddler Years" and "Solve Your Child's Sleep Problems." Everyone loves some shaving cream! This was suppose to be done on the patio because it gets messy (despite the fact that shaving cream can stain cement)! The kitchen was quite sticky afterwards. Lil Miss E had to be reminded not to put the shaving cream on the walls! I was telling her "no! Stop that!" as she painted the walls. She was quite proud of her mural despite being in trouble. 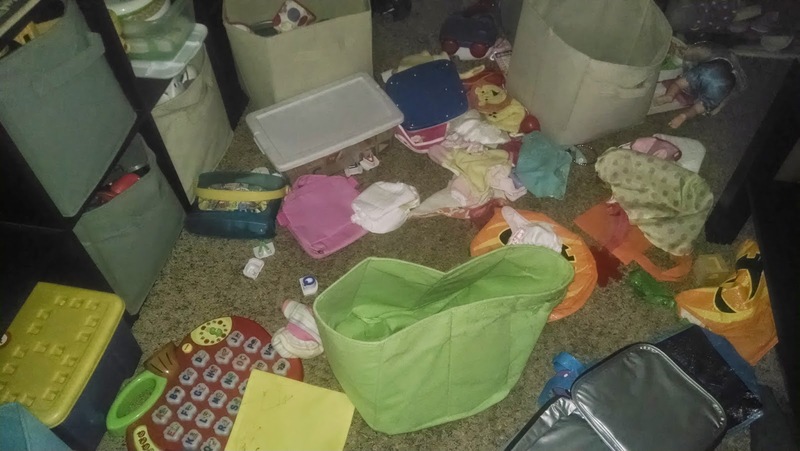 As I said, it was quite the mess to clean up. We ended our week with a visit from the Tooth Fairy! Max finally lost his first tooth (that just happens to be the first tooth he got in as a baby). He even pulled it out himself! His adult teeth had already started coming in, so it won't be much longer before he loses his other front bottom tooth. 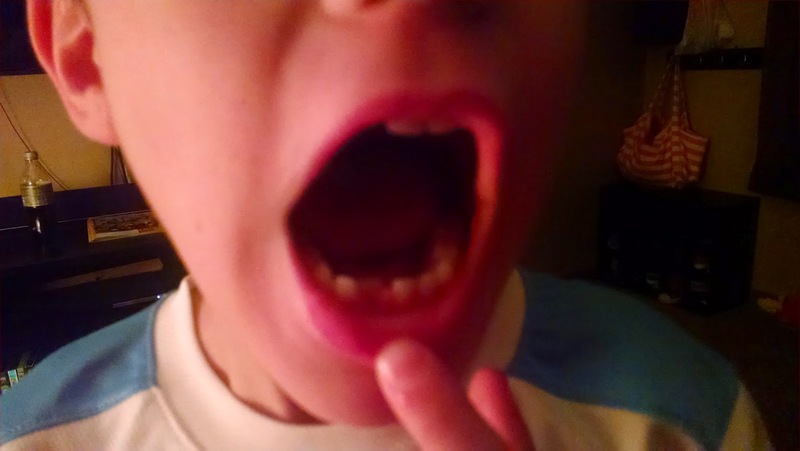 Harrison witnessed Max lose his first tooth and FREAKED! "I don't want to lose any of my teeth! Ever!" he whined and sobbed. Max wrote a letter to the Tooth Fairy about his tooth losing experience, while Harrison wrote a letter asking her to never take any of his teeth. Max left his tooth in a glass. 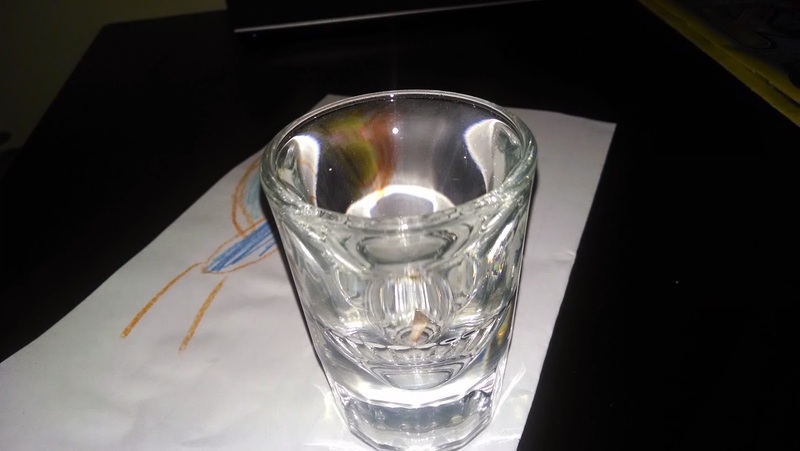 Yes it's a shot glass and it may or may not have been taken from one of our favorite bars we hung out at pre-kids. 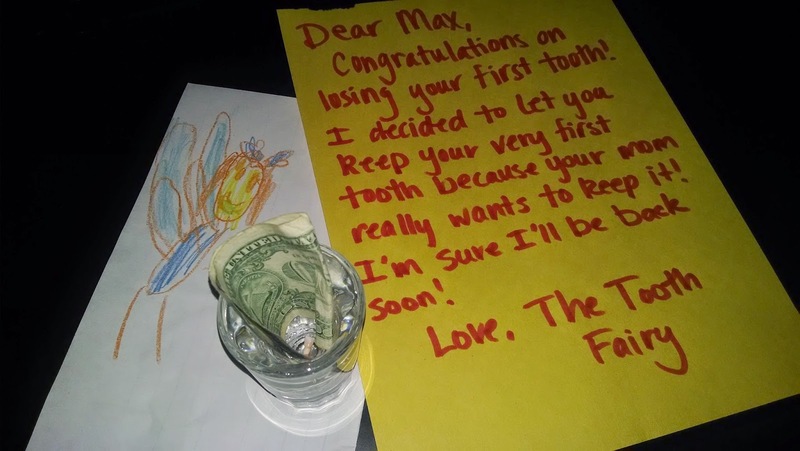 The Tooth Fairy left Max a letter! He hung it up with his letter from Santa and the Easter Bunny. Summer is coming to end this week, as kids start back to school. We'll be working on getting into our school routine (for my minis and the daycare kids), continuing with our school reviews (letters, numbers, etc. ), working on a daycare photo album, and a few activities we have yet to get to that were on our summer activity list.